Our Kuddles For Kids Program provides children and teens a sense of comfort as they face traumatic life events. 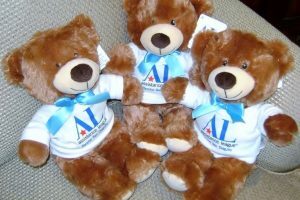 During our 2017-2018 fiscal year, we provided 216 bears to Rady’s Chadwick Center, Solana Beach Fire Department, Rancho Santa Fe Fire Department, Scripps Hospital in Encinitas and Women’s Resource Center in Oceanside. We also provided Rady’s Chadwick Center with 310 snacks for children and teens. 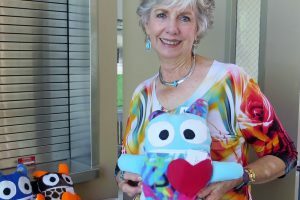 Kuddles For Kids also provides adorable critters that are handmade by our volunteers and donated to children at Rady’s Chadwick Center. They are given to children facing traumatic life events. The critters are not only huggable, they each include a heart-shaped pocket into which a child may whisper their worst fears. Every Caring Critter comes with a card that reads, “I eat your fears and worries and hold your hopes and dreams in my heart.” We donated 120 critters this year.